CRISPR ( C lustered R egularly I nterspaced S hort P alindromic R epeats) is a microbial nuclease system involved in defense against invading phages and plasmids. CRISPR loci in microbial hosts contain a combination of CRISPR-associated (Cas) genes as well as non-coding RNA elements capable of programming the specificity of the CRISPR-mediated nucleic acid cleavage. We have harnessed the type II CRISPR nuclease system to facilitate genome editing in mammalian cells (Cong et al ., Science 2013, Ran et al ., Cell 2013, Ran et al ., Nature Protocols 2013). The CRISPR/Cas system can be implemented in mammalian cells by co-expressing the S. pyogenes Cas9 (SpCas9) nuclease along with the guide RNA. For most applications, we recommend using Cas9 with the single guide RNA (sgRNA), which is derived from a synthetic fusion of the CRISPR RNA (crRNA) and the trans-activating crRNA (tracrRNA; Hsu et al., Nature Biotechnology 2013). We also have an older system using two cassettes to express the CRISPR RNA array and tracrRNA separately (Cong et al., Science 2013). Additionally, we have a plasmid expressing SpCas9 alone without sgRNA. Full references are below. 1. SpCas9 (or SpCas9n, D10A nickase) + single guide RNA: These plasmids contain two expression cassettes, a human codon-optimized SpCas9 or SpCas9n, and the single guide RNA. The vector can be digested using BbsI, and a pair of annealed oligos (design is indicated below) can be cloned scarlessly into the vector before the sgRNA scaffold. The oligos are designed based on the target site sequence (20bp) and need to be followed on the 3' end by a 3bp NGG PAM sequence. We have found that adding an additional guanine nucleotide to the 5’ of 20-bp guide can increase targeting efficiency. SpCas9 and SpCas9n with 2a-Puro and 2a-EGFP are also available. 2. SpCas9 (or SpCas9n, D10A nickase) + CRISPR RNA array + tracrRNA: This plasmid contains three expression cassettes. To target a given site, the plasmid can be digested using BbsI, and a pair of annealed oligos (design is indicated below) can be cloned into the CRISPR array. The oligos are designed based on the target site sequence (30bp) and need to be followed on the 3' end by a 3bp NGG PAM sequence. 3. SpCas9 alone: This plasmid contains a single cassette expressing human codon-optimized SpCas9; sgRNA can be co-transfected as PCR amplicons (Ran et al., Nature Protocols 2013). Browse the Addgene GeCKO Library CRISPR page for more information. Full references are below. SAM can be combined with a human genome-wide library to activate all known coding isoforms form the RefSeq database (23,430 isoforms) for gain-of-function screening. For more information, please visit the Addgene SAM library page . Visit the Zhang Lab SAM website for additional information, protocols, and an activator sgRNA design tool. 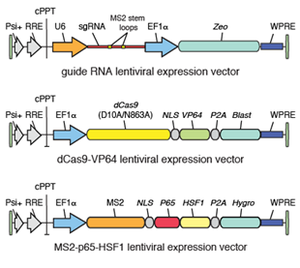 The Zhang Lab has both single- and dual-vector systems that allow the delivery of Cas9 and sgRNA in vivo via adeno-associated virus (AAV). The single vector system uses a smaller Cas9 from S. aureus (SaCas9) that has been human codon-optimized, and packages both the SaCas9 gene and its single guide RNA (sgRNA) into one plasmid (Ran et al., Nature 2015). The dual vector system uses S. pyogenes Cas9 (SpCas9), using one vector to express SpCas9, and another to express up to three sgRNAs (Swiech et al., Nature Biotechnology 2014). Full references are below. SaCas9 + single guide RNA: These plasmids contain two expression cassettes, a human codon-optimized SaCas9 driven by either the ubiquitous cytomegalovirus (CMV, PX601 [#61591]) or liver-specific tyroxine binding globulin (TBG, PX602 [#61593]) promoter, and a U6-driven single guide RNA. The vector can be digested using BsaI (This is different from BbsI, which is used in the SpCas9 plasmid series. ), and a pair of annealed oligos can be cloned scarlessly into the vector before the sgRNA scaffold. The oligos are designed based on the target site sequence (21-22bp) and need to be followed on the 3' end by NGRRT or NGRRN PAM sequences. We have found that adding an additional guanine nucleotide to the 5’ of 21-bp guide can increase targeting efficiency. These plasmids use the inverted terminal repeats (ITR) from AAV serotype 2. SaCas9 only: This plasmid (PX600, #61592) contains a single cassette expressing human codon-optimized SaCas9; SaCas9 sgRNA can be co-transfected as PCR amplicons using a protocol similar to SpCas9 sgRNA PCR (Ran et al., Nature Protocols 2013). SpCas9 Cas9: The PX551 plasmid (AAV-SpCas9, #60957) contains a single cassette expressing human codon-optimized SpCas9, driven by the truncated MeCP2 promoter (pAAV-pMecp2-SpCas9-spA) for expressing Cas9 in neurons. SpCas9 guide acceptor: The PX552 plasmid (#60958) contains pAAV-U6::sgRNA(SapI)_hSyn-GFP-KASH-bGH (SpGuide acceptor). This is a AAV plasmid for sgRNA cloning. GFP-KASH fusion facilitates FACS sorting of cells and nuclei. CRISPR-Cas9 is a versatile genome editing technology for studying the function of genetic elements. To broadly enable the application of Cas9 in vivo and ex vivo , the Zhang Lab established Cre-dependent and constitutively expressing Cas9 knockin mice (Platt et al ., Cell 2014). In these mice the CRISPR-Cas9 system can be implemented by delivering Cre and sgRNA to a Cre-dependent mouse or sgRNA to a constitutively Cas9-expressing mouse. Described here are AAV vectors that can be combined with Cas9 in a wide range of applications. Full references are below. Using Cas9 mice, Platt et al . simultaneously modeled the dynamics of KRAS , p53 and LKB1 , the top three significantly mutated genes in lung adenocarcinoma. Delivery of a single AAV vector ( AAV-KPL ) in the lung generated loss-of-function mutations in p53 and Lkb1 , as well as homology directed repair-mediated Kras G12D mutations, leading to macroscopic tumors of adenocarcinoma pathology. These plasmids as well as a backbone plasmid for cloning new targets are described here. This plasmid contains two expression cassettes, Renilla luciferase-2A-Cre recombinase and sgRNAs targeting the mouse genes: Kras , p53 , and Lkb1 . This plasmid also contains a KrasG12D homology directed repair donor template. This plasmid contains two expression cassettes, Renilla luciferase-2A-Cre recombinase and an sgRNA targeted to LacZ, which is not present within the mouse genome. This plasmid is used as a control for AAV-KPL. This plasmid contains two expression cassettes, Renilla luciferase-2A-Cre recombinase and an sgRNA backbone for cloning new targeted plasmids. The plasmid can be digested using SapI, which will reveal sticky ends to enable the rapid ligation of annealed and phosphorylated oligos designed based on the target site sequence (20bp). Using Cas9 mice Platt et al. demonstrated in vivo genome editing in the brain by AAV-mediated expression of an sgRNA targeting the neuronal-specific gene NeuN. As a control they designed an sgRNA targeting LacZ, which is not present in the mouse genome. These plasmids are described here. This plasmid contains two expression cassettes, Cre recombinase and an sgRNA targeted to the mouse NeuN gene. This plasmid contains two expression cassettes, Cre recombinase and an sgRNA targeted to LacZ, which is not present within the mouse genome. This plasmid contains two expression cassettes, Cre recombinase and an sgRNA backbone for cloning new targeted plasmids. The plasmid can be digested using SapI, which will reveal sticky ends to enable the rapid ligation of annealed and phosphorylated oligos designed based on the target site sequence (20bp). This plasmid enables Cre/loxP recombination and fluorescence assisted sorting of cells and nuclei in addition to sgRNA expression. This plasmid contains two expression cassettes, Cre recombinase-2A-EGFP-KASH and an sgRNA. This plasmid facilitates Cre/loxP recombination and fluorescence assisted sorting of cells and nuclei in addition to sgRNA expression. This plasmid contains two expression cassettes, Cre recombinase-2A-EGFP-KASH and an sgRNA backbone for cloning new targeted plasmids. The plasmid can be digested using SapI, which will reveal sticky ends to enable the rapid ligation of annealed and phosphorylated oligos designed based on the target site sequence (20bp). Multiplex Genome Engineering using CRISPR/Cas Systems. Cong L, Ran FA, Cox D, Lin S, Barretto R, Habib N, Hsu PD, Wu X, Jiang W, Marraffini LA, Zhang F. Science . 2013 Jan 3. DOI: 10.1126/science.1231143.PubMed. DNA targeting specificity of RNA-guided Cas9 nucleases. Hsu PD, Scott DA, Weinstein JA, Ran FA, Konermann S, Agarwala V, Li Y, Fine EJ, Wu X, Shalem O, Cradick TJ, Marraffini LA, Bao G, Zhang F. Nat Biotechnol. 2013 Sep;31(9):827-32. doi: 10.1038/nbt.2647. Epub 2013 Jul 21.PubMed. Double nicking by RNA-guided CRISPR Cas9 for enhanced genome editing specificity. Ran FA, Hsu PD, Lin CY, Gootenberg JS, Konermann S, Trevino AE, Scott DA, Inoue A, Matoba S, Zhang Y, Zhang F. Cell . 2013 Sep 12;154(6):1380-9. doi: 10.1016/j.cell.2013.08.021. Epub 2013 Aug 29. Erratum in: Cell. 2013 Oct 10;155(2):479-80.PubMed. Genome engineering using the CRISPR-Cas9 system. Ran FA, Hsu PD, Wright J, Agarwala V, Scott DA, Zhang F. Nat Protoc . 2013 Nov;8(11):2281-308. doi: 10.1038/nprot.2013.143. Epub 2013 Oct 24.PubMed. Genome-scale CRISPR-Cas9 knockout screening in human cells. Shalem O, Sanjana NE, Hartenian E, Shi X, Scott DA, Mikkelsen TS, Heckl D, Ebert BL, Root DE, Doench JG, Zhang F. Science . 2014 Jan 3;343(6166):84-7. doi: 10.1126/science.1247005. Epub 2013 Dec 12.PubMed. Improved vectors and genome-wide libraries for CRISPR screening. Sanjana NE, Shalem O, Zhang F. Nat Methods . 2014 Aug;11(8):783-4. doi: 10.1038/nmeth.3047.PubMed. Genome-scale transcriptional activation by an engineered CRISPR-Cas9 complex. Konermann S*, Brigham MD*, Trevino AE, Joung J, Abudayyeh OO, Barcena C, Hsu PD, Habib N, Gootenberg JS, Nishimasu H, Nureki O, Zhang F. Nature . 2015 Jan 29;517(7536):583-8. doi: 10.1038/nature14136. Epub 2014 Dec 10.PubMed. In vivo interrogation of gene function in the mammalian brain using CRISPR-Cas9. Swiech L, Heidenreich 1, Banerjee A, Habib N, Li Y, Trombetta J, Sur M, Zhang F. Nat Biotechnol . 2015 Jan;33(1):102-6. doi: 10.1038/nbt.3055. Epub 2014 Oct 19.PubMed. In vivo genome editing using Staphylococcus aureus Cas9. Ran FA, Cong L, Yan WX, Scott DA, Gootenberg JS, Kriz AJ, Zetsche B, Shalem O, Wu X, Makarova KS, Koonin EV, Sharp PA, Zhang F. Nature . 2015 Apr 9;520(7546):186-91. doi: 10.1038/nature14299. Epub 2015 Apr 1.PubMed. CRISPR-Cas9 knockin mice for genome editing and cancer modeling. Platt RJ, Chen S, Zhou Y, Yim MJ, Swiech L, Kempton HR, Dahlman JE, Parnas O, Eisenhaure TM, Jovanovic M, Graham DB, Jhunjhunwala S, Heidenreich M, Xavier RJ, Langer 9, Anderson DG, Hacohen N, Regev A, Feng G, Sharp PA, Zhang F. Cell . 2014 Oct 9;159(2):440-55. doi: 10.1016/j.cell.2014.09.014. Epub 2014 Sep 25.PubMed.